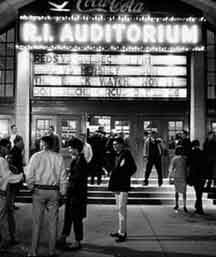 The Rhode Island Auditorium was built in 1925 by a group of investors headed by Rhode Island native Hubert Milot. It opened at 1111 North Main Street in Providence on Feb. 18, 1926. At that time there were only two organized professional hockey teams in the United States: the Boston Bruins and New York Rangers. 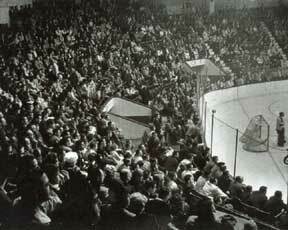 Surprisingly, when the Auditorium made its debut, it was not for a hockey game. Instead, an overflow crowd of 6,000 spectators jammed the new building to enjoy an ice skating show. The next fall, the Providence Reds joined the Canadian-American Hockey League composed of the Philadelphia Arrows, Quebec Beavers, New Haven Eagles and Boston Bruin Cubs. Judge James E. Dooley, a leading sports figure at the famed Narragansett Race Track on the Pawtucket-East Providence line, was founder of the first Reds team. In those early days, Jean Dubuc, a graduate of Notre Dame and former major league baseball pitcher with the Detroit Tigers, served as manager of both the Reds and the Auditorium, holding the title of president as well. Louis A. R. Pieri, a Brown University graduate, basketball and football player, became manager of the Auditorium in 1929. Then in 1938, he and his wife Mildred, daughter Lucille and son Louis took ownership of both the building and the Reds hockey team. Pieri later became one of the most important sports figures in the United States. For years, while the big building stood on North Main Street, it was called both R. I. Auditorium and The Arena. Photos of the edifice show the name R. I. Auditorium, backlit by neon lights on the marquee over the main entrance. Yet high above, at the very top of the building?s facade itself, was the word ARENA, painted in big, white capital letters. 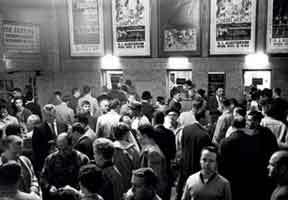 The thousands of fans who flocked there for hockey, basketball, boxing and shows of ever description, called it either R. I. Auditorium or The Arena. However, dating back to its very earliest years in the 1930s, the front page of every game program called it R. I. Auditorium. One dictionary says this about the word Arena: ?An area in a Roman amphitheater used for gladiatorial combats.? Maybe that?s why that grand old Providence sports landmark, plus hundreds of others around the United States, Canada and beyond, began taking on the title of Arena. The R.I. Auditorium -- or the Arena? A pre-game crowd in the lobby. A Sunday night crowd watches the game. The R.I. Auditorium in neon.